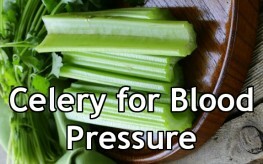 Dr. Michael Murray, a leading authority on natural medicine, says a compound found in celery seed extract offers promising benefits to people with high blood pressure. 3nB may lower blood pressure by acting as a diuretic and a vasodilator. Because it’s also able to lower blood cholesterol levels and reduce the formation of plaque build-up in the arteries, Murray and his colleagues think this could increase the elasticity of the blood vessels, leading to lower blood pressure readings. The research found participants who took two 75mg capsules of celery seed extract daily to have significant results—with systolic blood pressure dropping 4.6 mmHg and diastolic pressure dropping 4.5 mmHg in the first 3 weeks. At the 6 week mark, systolic pressure was down 8.9 mmHg and diastolic 8.5 mmHg. More than 60 million Americans have high blood pressure, and more than half of all Americans between the ages of 65 and 74 are affected. Unfortunately, most individuals take prescription drugs to manage the condition – drugs that are loaded with dangers and side effects of their own. Users often feel dizzy, tired, forgetful, and even depressed. Celery, obviously, doesn’t cause these negative effects. For more solutions, check out these 7 herbs and foods for reducing high blood pressure.